Hi again! I’m back with another classic fiction review! This was one of my favourite books as a child, and I still have a much-loved copy, which I am sure I will continue to re-read. ‘Ballet Shoes’ is about three sisters, who have all been adopted by an eccentric old man, and left to his niece while he travels around the world. So I guess they’re not really blood-related, but they grow up together, forming an unbreakable bond with each other, and with their guardian/mother, Sylvia. Sylvia’s nurse, Nana, is also a constant in their upbringing. The story starts when the girls are in their early teens, and their household is running out of money, their Uncle long presumed dead on one of his many travels. They are soon going to lose the house they’ve grown up in, and the money put aside by the Uncle before he went travelling is running out. But these women are competent and smart, and so they advertise for lodgers, taking in a variety of colourful characters. These lodgers change the family’s lives in a myriad of ways. The girls have recently had to leave school because it was becoming too expensive for Sylvia to manage, but two of the lodgers are retired teachers, and so they offer to teach the girls, while another lodger, Miss Danes, offers an even better solution to their current predicament: dancing. Through Miss Danes the girls are enrolled at a local dancing school, run by the formidable Miss Fidolia. Here, they take part in singing, dancing and acting lessons, as well as occasionally putting on shows to earn the school- and themselves- sizeable chunks of money. This book is all about the girls coming of age, and explores the way in which family ties lead people to do things they don’t want to do, showing how sisters will always look out for one another, no matter how dubious their blood. One of the reasons I loved this book so much as a child was because of the characters. The three girls- Pauline, Petrova and Posy- make this book what it is, and they are so interesting and vibrant. Pauline is the oldest- kind and smart, but also vain and arrogant. She will do anything to get the chance to act, and finds the glamorous life of movies stars exhilarating and enchanting. This book is set around the 1920s/1930s, and so this was a time when Hollywood was growing, and so I can see why this glamorous world would appeal to Pauline. Petrova was my favourite of the girls. She is sarcastic and funny, and would rather be fiddling with engines than singing and dancing up on a stage. She is shy and smart, and she wants to be just like Amy Johnson, the famous pilot. And yet she goes along with acting and singing on the stage in order to support her family. I liked her relationship with Mr Simpson, and their bonding over engines and cars was brilliantly written. The youngest sister is Posy. She is precocious, bold and brave, doing anything it takes to fulfil her destiny of becoming a world-famous ballet dancer, and taking many risks and chances along the way. Her fearlessness often causes problems for the family, but I loved how strong and determined her character was. All these sisters have their faults, but they are united in their aim to help their family, which was lovely to read. 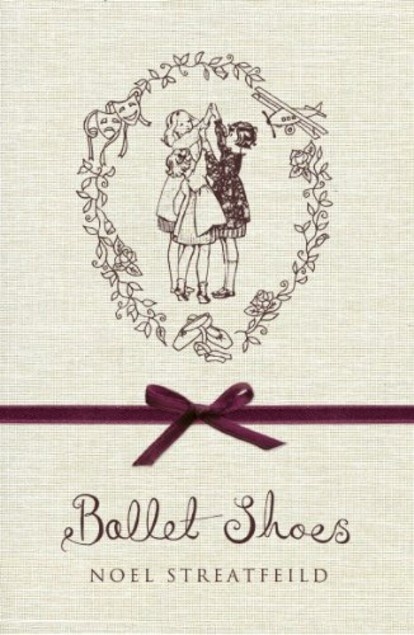 Have you read ‘Ballet Shoes’? Do you have any childhood classics that bring up feelings of nostalgia for you? Would you re-read them now? Let me know all your thoughts in the comments below, I love to hear from you, whatever you’re thinking! I’ve never read this, but this sounds like something I’d really enjoy as a kid (and probably even now)! I studied dance for years and with two sisters, I feel like I’d relate to these characters a lot. Great review, thanks for sharing! I loved it as a child, it really immersed me in the dancing world! Oh wow, you would definitely like it a lot then! I have no dancing talent, I just enjoyed reading about the sisters haha! Oh, my goodness! I loved this book when I was a kid, too, and I had totally forgotten about it! I need to pick up a copy for my nieces. Thanks for the reminder. Wonderful review! I’ve never read the book but I do remember TV series and that film with Emma Watson. It’s a great book and film! I’ve never read this but it seems like a good book. Maybe I’ll give it to my niece next year as a gift. What other books would you recommend? It is a great book! If you’re going for children’s classics, i loved what Katy did! But these are probably not relatable for children these days haha! I have never heard of this book but think I would like it. I think I will try to find a copy. Thanks for telling me about it. I haven’t re-read many of my favorite books from childhood, but I did re-read the Laura Ingalls Wilder books and enjoyed them very much. Ooh, I hope you enjoy it if you manage to pick up a copy- I really recommend it!